On June 8, 2015, Russian presidential aide Yuri Ushakov announced a plan to establish a high-level working group to focus on the development of bilateral cooperation in the fuel and energy sector. «A high-level working group, specially created within the framework of an intergovernmental commission, will devote itself to developing a partnership in the energy sector», said Ushakov at a briefing in Moscow. This statement was made on the eve of the Russian president’s scheduled visit to Baku on June 12-13, during which he will attend the opening of the first European Games. It is expected that his agenda will include meetings with the presidents of Azerbaijan, Ilham Aliyev, and Turkey, Recep Tayyip Erdoğan, as well as with the head of the International Olympic Committee, Thomas Bach. Moscow and Baku have already taken some steps to expand their cooperation, particularly in the petrochemical sector. In 2014, their bilateral trade amounted to $4 billion USD, a 12% increase over 2013. In the first quarter of 2015, the two countries did $707 million dollars’ worth of business with one another (a jump of 5.8%). Negotiations are in progress to permit the mutual acceptance of customs inspections of fruit and vegetables, and if those talks are successful, Azerbaijan will become the first country with which Russia will have this type of working policy of mutual acceptance of customs inspections. Now there are likely to be expectations that this bilateral cooperation between the two countries will ascend to a new level, even in the energy sector (Azerbaijan and Russia are often seen as competitors), which would make it possible to at least improve a situation that is currently marked by reticence and lack of clear communication. It appears that the biggest joint infrastructure projects are intended to create an alternative to the energy sources being promoted by the US and EU, which would include the construction of the Trans-Caspian gas pipeline. On June 9th, a spokesman from the Russian Foreign Ministry Alexander Lukashevich took questions from the media and reiterated that unilateral action on the construction of that pipeline would erode trust between the countries bordering the Caspian Sea. «It is possible that this is what lobbyists for that project from countries outside the Caspian region are trying to achieve, offering themselves as ‘strategic partners’ to the Caspian states and promising the pipeline’s advocates all sorts of political dividends», commented the spokesman. In addition, Lukashevich pointed out that during the meeting in Astrakhan in 2014, the leaders of the five countries bordering the Caspian Sea publicly and emphatically stated that only states adjoining that sea have the right to make decisions on important issues affecting the Caspian, and they reaffirmed their shared responsibility for its future. «We feel that the pipeline is certainly one of those issues», the diplomat noted. The hypothetical Trans-Caspian gas pipeline is of course needed in order to connect gas fields in Turkmenistan with the Southern Gas Corridor (1) (which includes the TANAP and TAP gas pipelines that will be delivering fuel to the EU by 2020). Vitaly Beglyarbekov, Socar’s deputy vice president of investment and marketing, claims that approximately $1 billion is being invested to bring the project to fruition with the assistance of international partners, among which are companies from Asia and Europe, including LUKoil (2), Shell, Gaz de France, Gas Natural of Spain, ENEL, and Gera. When European politicians and bureaucrats actively promote pipeline projects that bypass Russia this heightens direct competition between Russia and Azerbaijan, which is positioning itself as not only a producer, but also a key transit country for energy. The fact that that Caspian country is fairly closely integrated into the energy alliance between Brussels and her patron, Washington, could be inferred from Beglyarbekov’s statement that his country «doesn’t see any obstacles to shipping gas from Turkmenistan under the Caspian Sea. We realize that the boundaries of the sectors between Azerbaijan and Turkmenistan have not been demarcated. But putting in a pipeline does not in any way conflict with the legal status. It doesn’t matter which seabed the pipeline runs along, since taxes and fees are not levied offshore». The official statements from Baku radiate optimism. 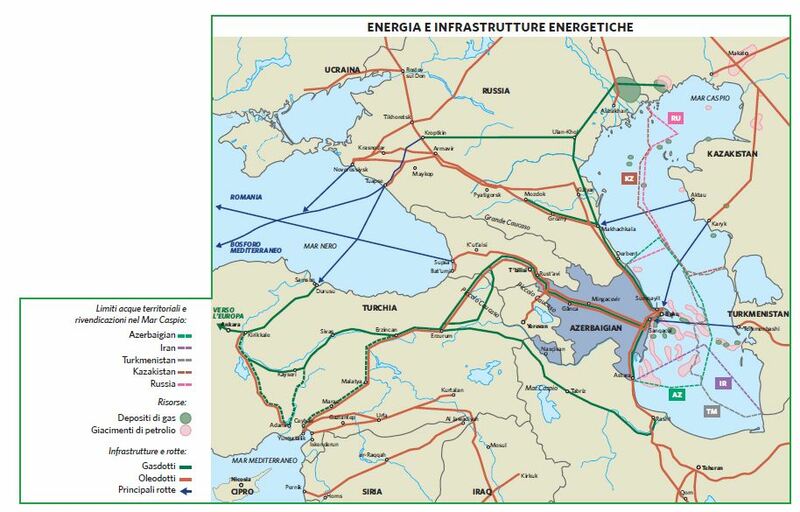 During the international Caspian Oil & Gas 2015 conference in Baku in early June, Azerbaijan’s minister of energy, Natig Aliyev, stated that his country is becoming a key player in the energy sector, noting that Europe is deeply concerned about its energy security. Azerbaijan produced 42 million tons of oil in 2014 and 29 billion cubic meters of gas. «Azerbaijan will try to increase its annual oil production to 45 million tons and double its gas production. To this end Azerbaijan is developing a new program of gas production and supply», explained Natig Aliyev. And late last month President Ilham Aliyev said that his country could have enough gas to supply both domestic and export needs for at least the next 100 years. Meanwhile, between January and May of 2015 SOCAR’s drilling departments reduced their drilling by 29.4% compared with the same period in 2014, down to 43,918 meters. Exploratory drilling accounted for 1,000 meters of that (a decline of 37.4%), while 42,918 meters came from production drilling (a drop of 29.3%). In addition, cooperation in the energy sector would bear no resemblance to any sort of one-sided Western dependence on that Caspian republic, which in the past has not had, nor does it have today, sufficient funds to carry out the mission foisted upon it to be a «major world energy supplier». (3) It is foreign companies (and not only they) who are meeting those objectives, which must include attempts to influence the foreign policy of this country rich in oil and gas. Of course, all this is being accompanied by flattering assessments of Azerbaijan’s role in «strengthening the energy security of all of Europe», but this kind of praise from representatives of other states should be more alarming than reassuring. Russian-Azerbaijani political and diplomatic contacts are being very carefully monitored by the organizations involved, and it would seem that it is no coincidence that some observers predict heightened competition in the near future between the two countries in the energy sector. Although this will clearly be good news for Europe, it will hardly improve stability in the Caucasus and Caspian region. Of course given the unregulated legal status of the Caspian Sea, any unilateral actions could be replete with very complex repercussions that could have unexpected impacts on both industry as well as the natural environment. There can be no doubt that Azerbaijan maintains a balanced policy in regard to Russia, which is prompted by her desire to be a good neighbor and to ensure the mutual benefits of their relationship, without the baggage of ludicrous anti-Russian hysteria. Although when viewing some stories in the local press, one could at times come away with a somewhat different impression, and the intensive efforts to detect the «hand of the Kremlin» in the difficulties getting the TAP project off the ground are hardly most egregious example of that. Moscow and Baku have many subjects to discuss, which include regional conflicts, combating cross-border terrorism, and expanding trade and economic cooperation. Bilateral agreements regarding joint actions in foreign markets would be highly desirable as far as aligning their mutual interests in the energy sector, especially in a situation where there are ample opportunities. Thus, if both sides take a constructive approach, the bilateral high-level working group that is being created will have plenty to do - assuming, of course, that its work does not become merely ceremonial. As we know, the co-chairmen of the intergovernmental commission under which the group will operate are the two countries’ deputy prime ministers, Dmitry Rogozin and Yaqub Abdullah-ogly Eyubov. The commission‘s 15th meeting is scheduled to be held in the second half of 2015 in Ekaterinburg. (1) It is periodically suggested that some kind of tripartite energy strategy be created between Turkey, Azerbaijan, and Turkmenistan. (2) LUKoil is involved in the project to develop the Shah Deniz gas field, holding 10% of the shares and with an investment of $700 million USD. (3) Azerbaijan possesses 0.6% of the world’s natural gas and 0.7% of global oil reserves. Will the European Union Become Part of Turkey?